A scene from the Green Pasture's New Year Event! Linda and I saw in the New Year with the best party in town! 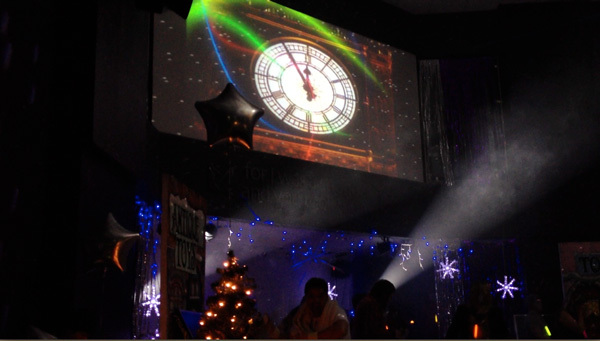 The annual Green Pastures New Years Eve party. Everything this church does, it does well, as you will read shortly! The first three weeks were spent wifeless as Linda flew to Australia to be with our daughter as she gave birth to her second son mid January. Nightly 'Skype' kept me up to speed on events there. Linda need not have worried about me starving. Friends took pity on me and I dined out richly in so many homes. The annual CRi Prayer Ministry School school continued through to mid-February, with Saturday morning follow up school still ongoing for the very keen ones. When the school ends, many make prayer ministry requests. A busy time, but a time that the whole team enjoy very much. Green Pasture's Freedom House opens. In an effort to clear the back-log of prayer ministry requests at Green Pastures (over 300 have received prayer ministry so far) and make room for the needs of the first girls to arrive at Freedom Centre, the whole CRi team agreed to do two full Saturday's of Prayer ministry at the church. The first date was February 18th, and the second Saturday was March 24th. It always thrills me to see the whole team in action. We've been together for so many years now and we love working together. I have been teaching at Pierrepont for some 13 years now, and this is my 26th NETS school that I have taught on. Home from home! On Tuesday March 13th I taught Term 4 students all day on the subject 'Hearing from God' and on the next two days I taught on 'The Father-Heart of God' It never ceases to amaze me how many countries the students come from. In recent years China is especially well represented. The students love this break from the classroom, but as you can see from our dress code, the weather was still winter. Clicking on the email above will take you through to the recording. 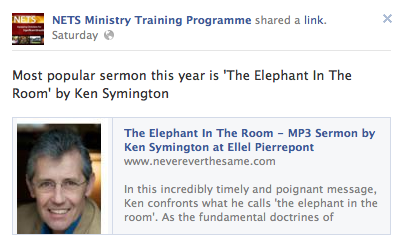 Update on April 17th from Ellel Pierrepont 'Hi Ken, Your sermon 'The elephant in the room' has been shared via Facebook more than any of our other sermons - 116 shares as of today. The page with the talk on has had 800 unique page views with 200 of those people visiting the page twice which is very high. I hope this is encouraging! On Sunday March 11th we did something new at CRi. Instead of going to our own churches we invested the whole day in a teaching that I gave on Prayer and Intercession. This teaching is taken from the full weekend teaching that I do, usually overseas, on Prayer, Intercession and Spiritual Warfare. (available Ellel Australia as far as I know) This day was in preparation for the team planning to go deeper into prayer than before. 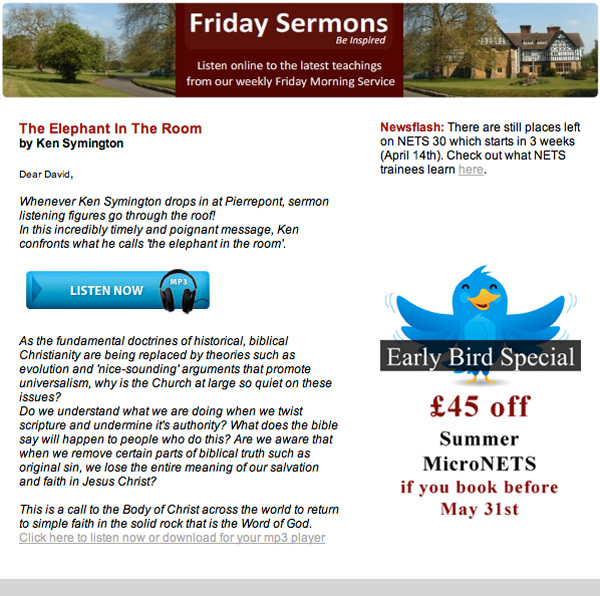 Having just spoken on this subject at Ellel Pierrepont one week earlier I used an expanded version of the same teaching 'The elephant in the room' It is a very challenging teaching. 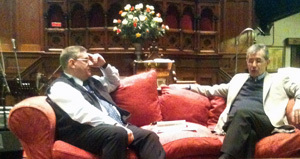 On Tuesday march 13th I left home early and flew to Liverpool, then travelled to Ellel Grange to spend the day with Ellel Ministries founder and international Director Peter Horrobin, and also Sovereign World Publishing's managing director Paul Stanier. The good news is that the current book is selling very well, and has gone into its second printing already. It is currently being translated into another language. Seven CRi team travelled to 'God's garage, Portroe, Tipperary on Friday April 20th, returning Sunday 22nd. On Friday evening I taught on 'The Holy Spirit' and on Saturday morning 'God's testings'. Saturday afternoon was given over to prayer ministry and people received 1-2 hours of individual ministry. "I am so blessed to know such a wonderful family in Christ. To one and all, Davy, Colin, Simon, Heather, Linda ..thank you for laying time aside, for listening for the whole counsel of God. Oh happy day that I met you. 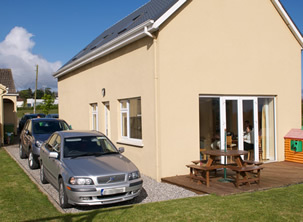 20 years of waiting to meet people like your team.."
Several days later I received this encouraging message from the web site..
"Hi Ken Linda and all in CRI, just to say thank you for the wonderful weekend we had in Portroe last weekend, and to say what a wonderful blessing ye all are to us in this part of Ireland. We were greatly blessed as indeed we are every time ye come down, and we wish God's blessings on ye all as ye bring God's blessings to us. Thank you once again, God Bless"
April 27th - 29th a seven strong CRi team went to Lifeline Recovery Centre, near Clougherhead in Southern Ireland. This centre, run by Phillip Richardson works with men who have come out of drug and alcohol addiction. We have been working closely with Lifeline for six years but we all agree that this weekend was one of the most anointed that we can recall. The Presence of God was so real all weekend. What a privilege! On the Friday evening and all day Saturday May 11-12th, I taught on the 'Father heart of God', at Green Pastures, Ballymena. The sense of God's Presence was evident to all and at ministry time there were some wonderful break-throughs. One of the ladies from the new Freedom House had a very special breathrough which left many of us in tears as we witnessed what was happening. As a follow up on the following three Monday evenings I taught on 'Rejecting Rejection', 'Freedom from fear' and 'Mindsets and inner vows', which are all part of the freedom series. On May 23rd I met with a group of Church of Ireland ministers, ministers in training and deacons at The Jethro Centre in Lurgan. Originally it was booked as a talk on Freemasonry, but after correspondence asking for background details of my ministry it was changed to an open brief, and I told of my somewhat unusual journey with Jesus. This led to questions and some stayed behind afterwards to continue the discussions that arose from the talk. It was well received and some of the group have indicated that they will be in contact in the future. One minister termed it 'a God appointment' I was blessed to hear that they had recently been working with other churches in the area and had brought over an american evangelist for an all church outreach, which produced truly remarkable fruit. I was also impressed with their heart for the broken and wounded. Good things are happening out there! May 10th, 17th, 24th & 31st - I did four Thursday evening talks on the Father heart of God at Bangor Elim's Explore programme. It was well attended, very well received, and on the final evening 26 books were sold. June 4th - a nine strong CRi team made a one day visit to Lifeline Recovery to teach and minister into all aspects of abuse that may have affected these young men's lives. (Physical, verbal, emotional, spiritual, financial and sexual) The morning was devoted to teaching and after lunch to one-on-one prayer ministry which the men greatly appreciate. June 14th - I spoke to the Green Pastures 80 strong worship and creative media teams on 'The journey' It was a very challenging message and very well received. Thank you Green Pastures for trusting me to speak to your people. Team training nights continue every Tuesday evening, year in, year out. Now in our 12th year! 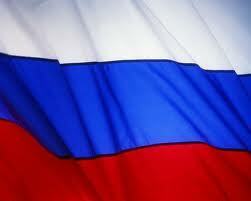 An invitation to return to Russia. I have accepted an invitation from the Bishop and leadership of the Pentecostal Union of Churches in Krasnodar, Russia, who asked if I would speak about the Father Heart of God at a men's conference specifically for pastors and leaders from throughout the union. This would take place on 12-13 October this year. The invitation said that this teaching is desperately needed in Russia where families have been systematically broken up and these leaders know that they will only be able to pastor their churches properly if they themselves know what it is to have and to be a father. Some of the leaders had heard me teach on this subject for one evening way back in the year 2000 at Rostov-on-Don, and were anxious that this should be shared with a wider audience. It will be a privilege. I am well into the writing of what I trust will be my next book. 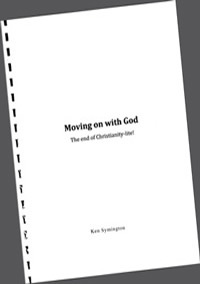 It is called 'Moving on with God. The end of Christianity-lite!' This extract from the introduction explains it's purpose. " This book is my best attempt to answer that. Every chapter can be a stand-alone chapter, or, you can take it step by step. This is a challenging book for those who take, or want to take, their walk with Jesus seriously. No more luke-warmness. No more compromise. No more excuses. What counts is a life that counts. What counts is our response to those two words from Jesus. Those who have read the book will be well aware of the two deeply touching poems that were included, one near the beginning - a poem of despair, with just a hint of hope - and one at the end declaring victory and freedom. These were written by Dee Smith who lives in England. This photo was taken when she came to stay with us at the end of December in order to join the team in our our end of year thanksgiving. Years ago she was a very, very broken lady. Her first poem explained why. Today, she is a confident wife and mother and friend. And today, one of our great friends. A trophy of grace.. Thank you Jesus. There is always much prayer ministry going on, week in, week out. In February we were asked to spiritually cleanse a house where unusual things were happening. We were also asked to spiritually cleanse a church. In April we were asked to spiritually cleanse a large school. All part of the church's remit in Jesus's Name. Next Newsletter will probably be at the end of September after a busy summer involving much international travel. Ellel Pierrepont near Farnham in Surrey. Giving Friday morning Communion sermon on 20th. 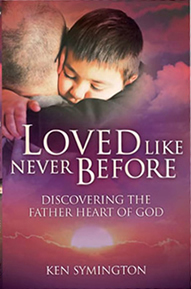 August 3 - 5 - 'Father heart of God' at Ellel Springhill, near Perth. August 26th - Sunday morning church message.